Over the past decade, there has been on and off, success and failure of efforts bringing electronic intermediaries to shipping business. People were in high hopes that electronic intermediary can reduce the searching time and cost, lower the transaction friction and improve the market efficiency same in shipping. Unfortunately most electronic intermediaries failed to live long. From a different perspective, this graduate work thrives to answer a question: “how do electronic intermediaries fit in shipping business?” To start with, it looks at the different roles of intermediaries and the added value of an electronic intermediary. Afterwards, in order to exam those in the shipping market, the market features and the current application of electronic intermediary in shipping have been carefully studied. 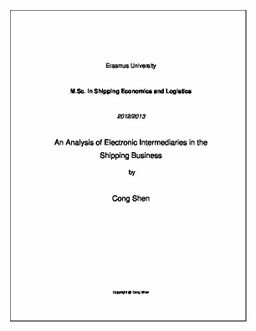 This research culminates in a simulation model of electronic intermediary in ship chartering brokerage, developed from a mathematic model and through three scenarios creation. The simulation result shows that electronic intermediaries can offset its weakness by relying on a definite large searching scope and/or to team with current intermediaries. To provide a comprehensive answer to the research question, the second methodology consisting of two case studies is employed: TradeWinds and Steminorder. Guided by the results from quantitative model simulation, these two cases are anatomically researched to reach the conclusion of four strategies for electronic intermediaries in shipping: human intelligence imitation, critical mass, positive network externality concept and large searching scope. At the end of this graduate work, recommendation and strategy advice in line with our conclusion are presented, for the business entrepreneurs in this field.